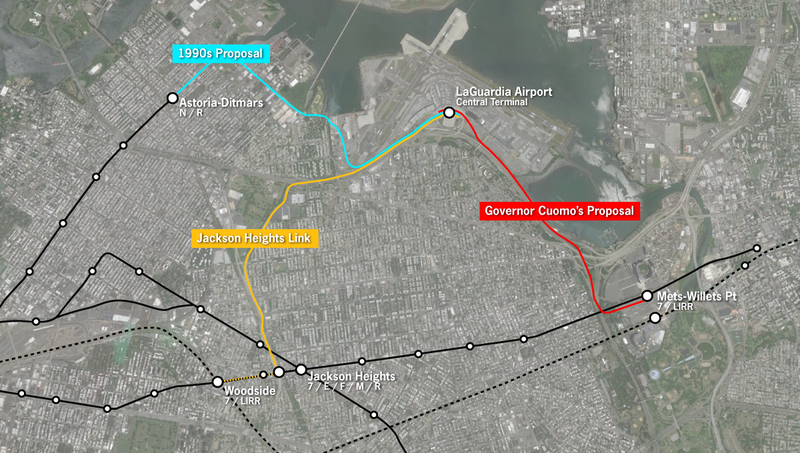 Governor Cuomo proposes AirTrain to LaGuardia, but would it actually help? 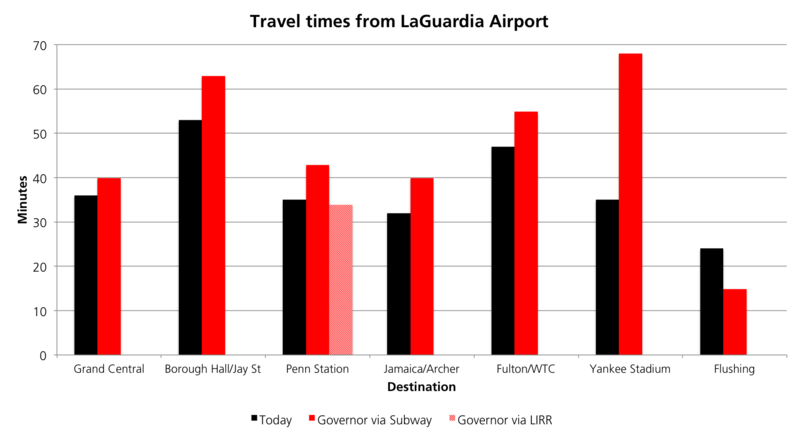 - Archpaper.com Governor Cuomo proposes AirTrain to LaGuardia, but would it actually help? 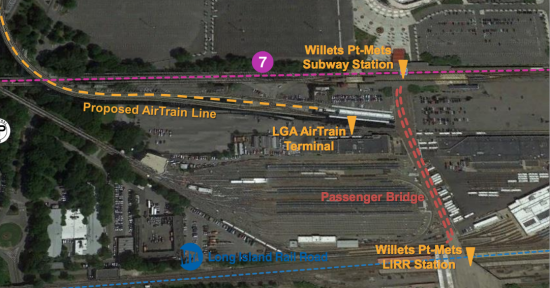 Governor Cuomo proposes AirTrain to LaGuardia, but would it actually help? Day One: New Yorkers rejoice as their governor, Andrew Cuomo, announces his intent to bring AirTran service to LaGuardia Airport. Day Two: Well-respected transportation blog The Transport Politic digs into the $450 million plan and shreds apart some of its ambitious goals, namely the time savings it takes to get to the airport. 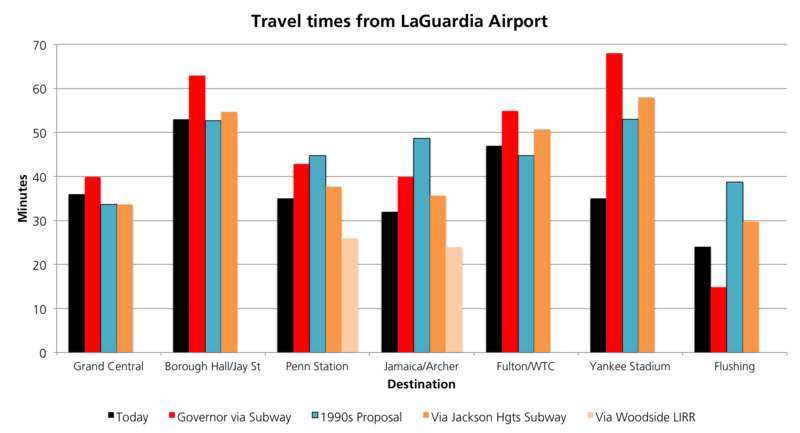 Using the LaGuardia AirTran would actually be a less convenient way to get to the airport than the slow and unreliable options that currently exist. The plan, which is in its early stages, would mean building an AirTran station by Citi Field, between an existing Long Island Rail Road stations and a 7 line subway station; the elevated train would then connect to LaGuardia via the Grand Central Parkway. The Cuomo Administration says the distance traveled is 1.5 miles, but Transport Politics puts it closer to 2.3. Since the new rail line would travel alongside a highway, it would cause minimal disruptions for existing neighborhoods, making this whole thing a much easier pitch for Cuomo, at least politically and financially. Cuomo says the state has the money to pay for the plan through existing funds. But if the LaGuardia AirTran is built as currently proposed, it would actually mean a longer ride to the airport from many major population centers. 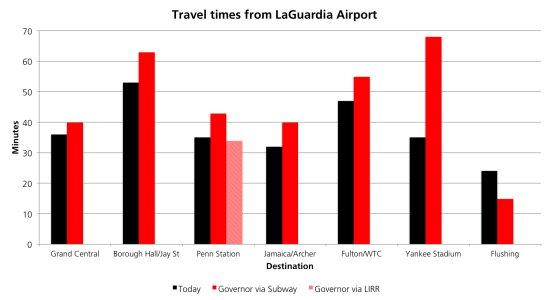 Travelers heading to LaGuardia from Midtown, Downtown Brooklyn, Central, Queens, and the South Bronx would be better off taking one of the bad public transit options that already exist. The new AirTran would, of course, be faster for anyone living near Citi Field, and would shave a few minutes off the ride from Penn Station for those taking the Long Island Rail Road. This is not the first time that the city has looked into ways to make New York City’s closest airport not feel so far, far away. A 1990’s plan, for example, would have extended the N subway line from Astoria, Queens right to LaGuardia. But as Transport Politic noted, the extension was squashed by neighborhood opposition because people apparently didn’t want an elevated rail line cutting through their neighborhood. Check out Transport Politic’s handy chart below that compares travel times of that 90’s plan, Cuomo’s plan, and an alternate plan for a connector from Jackson Heights, Queens.